Industrial and production machinery performs more efficiently and has a longer life while securely isolated and "floating" on Sorbothane® mounts. 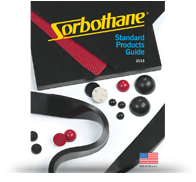 Integrated Sorbothane® components can reduce vibration and attenuate damaging impact shock, recovering fully for recurring cycles. Custom Sorbothane® bumper systems are being used right now to protect products at end-of-line packaging stations. It's a reliable material that can accept repeated compression without taking a set. See samples of solutions we’ve provided to the Industrial & Manufacturing Equipment Industry.